One of the perks of running CG is we often get sent gadgets to review, most of the time we’ll give them out to the community as prizes (we currently have a $1,000 competition running and since the start of that competition we’ve received another $1,500 worth of prizes for the next one :)). This next bribe, freebie review piece is one we’ll be keeping as we had to make it our selves, Kokino the Paper Robot toy. 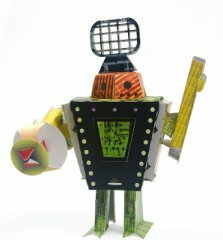 A1 Quality Toys contacted me a little while ago to ask if I’d like to review their Paper Toy Robot, as I’m one to rarely say no it turned up a few days later, thanks guys. The envelope contained all the bits to make my own Kokino robot. There were ~20 different pieces (all precisely cut by laser) on 5 cards. This was one of those projects that I enjoy doing with my daughter who probably loves gadgets and making things more than I do (she did name my Roomba Dexter after all :)). The little paper droid was very easy to assemble (it took the two of us about half an hour). We didn’t need glue or scissors as all the pieces simply slotted together. Upon completion it is very robust, especially considering what it’s made from and that no glue was used. It was one of those rare projects were when completed it actually looked like it was supposed to (see pic below) and was fully functional with rotating arms and head. You can get your own Kokino Robot from A1 Quality Toys (the toy looks a LOT better than their website :)), thanks guys for my free one. I visited the site in search of a cardboard robot for my son science project at school. I just wanted to say I thought this was just the coolest paper robot I had ever seen. I live in Houston, Texas and I am in search of one of your stores that carry this item. My son Kameron is 6 years old and this would blow him away. That robot you built looks ausome. It looks so ausome I am going to try it out, then I will write you back and tell you how it worked out!!! PS:I’m looking forward to it!